As the largest city in South Africa and the country’s financial hub, Johannesburg is a popular tourist attraction. Situated on the edge of the world's largest known gold deposit, the City of Gold offers visitors a vibrant mix of attractions, ranging from opulent boutique stores and world-class restaurants to five-star accommodation and adventurous day tours. If you are planning a trip to this multi-faceted city you might be wondering when is the best time of year to visit Johannesburg? Due to the city’s subtropical climate, the temperatures in Johannesburg are fairly mild all year round, making it the best place to visit any time of the year. Visitors can expect pleasantly warm summers, usually sunny, but with some afternoon thunderstorms. During winter, Johannesburg’s climate changes, bringing colder, yet sunny days while minimum temperatures at night can go near freezing. As one of the top tourist destinations in South Africa, there is a multitude of relaxing, thrilling and romantic things to do in Johannesburg. Whether you are drawn to the city’s luxurious attractions, curious about its fascinating cultures or inspired by its spectacular wildlife, Johannesburg is truly a remarkable place to visit. If you are planning on visiting this magnificent city you might enjoy some of these top things to do in Johannesburg. Having grown from a small village in 1886 to one of the 50 largest urban areas in the world, Johannesburg has a multitude of stories to tell. With Soweto Tours, you can embark on a journey of discovery choosing from a range of day tours. The Lesedi Cultural Village Tour offers the opportunity to experience the rich African culture first hand: step into Xhosa, Zulu, Pedi, Basotho and Ndebele villages, listen to traditional music, hear the people’s fascinating stories, experience a tribal get-together with traditional dancing and enjoy a Great African Feast, tasting some of the local delicacies. Pilanesberg National Park, home to all of the Big 5 (elephant, rhino, leopard, buffalo and lion) is considered one of the most romantic Johannesburg attractions. This untouched wilderness can be admired on Soweto Tours’ Pilanesberg Open Vehicle Day Tour. The mild temperatures in Johannesburg make this safari enjoyable all year round. If you are planning a vacation engagement and in search of romantic proposal ideas in Johannesburg, we recommend booking a private tour and getting down on one knee as the sun sets with the wild African landscape as a backdrop. The prestigious Sandton area is renowned for the best retail, entertainment and nightlife offerings and the most luxurious accommodation with the added benefit of providing travellers easy access to the Gautrain station. It’s therefore not surprising that when it comes to accommodation in Sandton City and the surrounding areas, guests are spoilt for choice. Hotels in Sandton are simply in a league of their own. Adjoined to Sandton City is the lavish five-star Sandton Sun Hotel. Aside from a variety of restaurants and bars, the hotel has a deck that offers visitors a breathtaking view of Sandton’s iconic skyline, while guests wanting to relax and rejuvenate can book a treatment at the Sandton Sun Spa. The spa features a tranquil couple’s treatment room complete with double volume shower and couples’ bathtub where you and your partner can relax and reconnect in a romantic, serene setting after your day out. The DaVinci Hotel and Suites, located on Sandton’s prestigious Nelson Mandela Square, is a five-star hotel that offers direct access to Sandton City. This haven has all the luxuries and comforts guests have come to expect from a Legacy hotel: an outstanding restaurant and lounge, fitness centre, infinity pool and spa, as well as world-class conference facilities. Guests are also spoilt with the luxury of their own Nespresso machine and same-day laundry services, placing this hotel among the very best accommodation in Sandton City. Sandton City Restaurants offer visitors a sublime selection of dining options. If you are in search of a truly South African dining experience you might enjoy The Butcher Shop & Grill. Conveniently located in Sandton City’s Nelson Mandela Square, this popular restaurant offers a fine blend of genuine South African culture, exceptional food and world-class wines, including some heritage vintages. Mature well-aged beef and lamb is the establishment’s hallmark. Diners have a choice of some of the finest quality meat, which can be cut according to their order by a skilled artisanal block man. If you are in search of a more low-key, romantic venue we recommend heading out of bustling Sandton City to Rosebank where you’ll find Clico Restaurant. Not only does this top-rated restaurant offer a refined dining experience; it’s also one of the most romantic restaurants in Johannesburg – with a fireplace for cold evenings and large doors opening onto a beautiful garden for daytime dining. Headed by Chef Marnus Scholly, the establishment is known for its sophisticated ambiance, superb, unobtrusive service and seasonally inspired, beautifully plated, six-course tasting menu, paired with high-end wines. The wine selection is a collection of local varietals and vintages from boutique South African wineries, which changes seasonally with the menu. Highly acclaimed for its cuisine and ambiance, Clico is a premium choice, whether you are in search of an unforgettable dining experience or planning on asking your significant other for her hand in marriage at one of the most romantic proposal venues in Johannesburg. There is a multitude of romantic things to do in Johannesburg – from candle-lit dinners and spectacular sunsets to lavish couples spa treatments. However, if you truly want to dazzle your significant other we invite you to visit the Shimansky Store in Nelson Mandela Square at Sandton City Mall. Our newly remodelled boutique store features an array of iconic Shimansky diamond and tanzanite jewellery creations. Whether you are browsing for an engagement ring, an anniversary gift, or you simply want to spoil yourself, or a loved one, with a beautifully crafted statement piece from one of Shimansky’s signature jewellery collections, we are sure there is a creation that will steal your heart. Shimansky has a license to buy rough diamonds and other precious metals direct from South African mines, a unique privilege among jewellers. This affords us the opportunity to hand-select only the best rough diamonds for our exquisite jewellery pieces. Our responsibly sourced diamonds are meticulously cut and polished into mesmerising displays of light by our master craftsmen – the only diamond cutters in the world who have perfected Shimansky’s internationally patented diamond cuts for our signature jewellery collections. 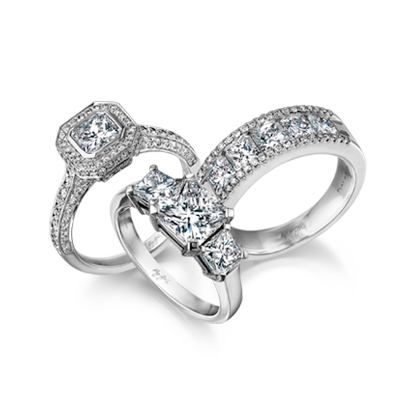 The Shimansky My Girl Diamond Collection features our patented My Girl Diamond cut - the world’s first square-cut diamond with a diamond-shaped table, pioneered by Founder and CEO, Yair Shimansky. This world-renowned diamond cut was the first internationally patented cut to originate from South Africa, making it a truly exceptional creation that cannot be bought anywhere else in the world. As one of the most iconic Johannesburg attractions, Shimansky offers visitors the opportunity to take home a unique African treasure. We invite you to visit our Sandton Store where our passionate and dedicated team will gladly guide you on your journey of discovery in finding an exceptional creation that speaks to your heart.